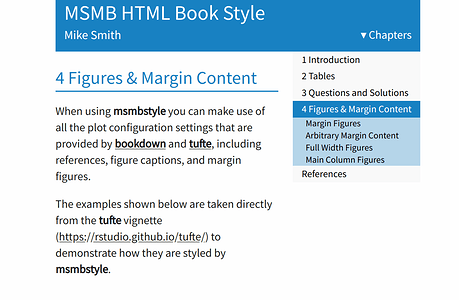 Given the influence of the Tufte Handout styling on the printed copy of the book, msmbstyle relys heavily on the tufte package to provide notes and figures in the margin. Where possible it reuses tufte code (including via tufte::: if the required function is not exported). This means that all formatting options provided by tufte can also be used within an R Markdown document styled using msmbstyle. We include the functions msmb_html and msmb_html_book (adapted from corresponding functions in tufte) that can be set in the output field of the YAML header. 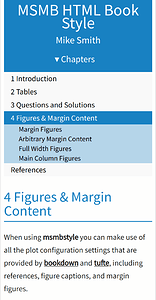 These apply additional modifications to the HTML to provide the header bar and drop-down navigation menu. 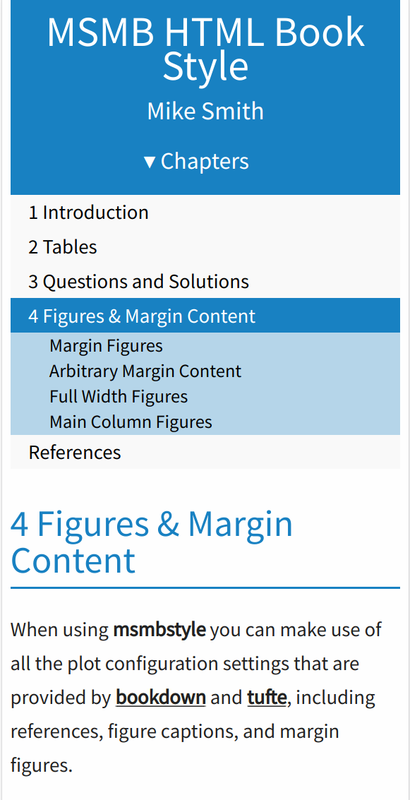 Questions can optionally be labelled, numbered, and referenced within the main text. This is done within the internal function msmb_build_chapter (based on bookdown::html_build_chapter). This functionality is similar to using one of the 'Theorem' environments, but with the option to mark the start and end within the document, rather than putting content within a single code-chunk. These additions are styled, along with some more minor tweaks from to the tufte formatting, using an additional CSS file distributed with the msmbstyle. This also attempts to provide a coherent experience when using mobile devices, modifying the layout and navigation options appropriately e.g. Jaw dropped! This is exactly the type of bookdown extension that I was looking forward to. I didn't really spend much time on the Tufte style in bookdown, and I was hoping someone else could pick it up and polish it. Thanks for the wonderful package! In the future, I'll recommend everyone who wants to use the Tufte style with bookdown to use the msmbstyle package. Great, I'm glad it was the sort of thing you were looking for, it's been a fun project to work on. 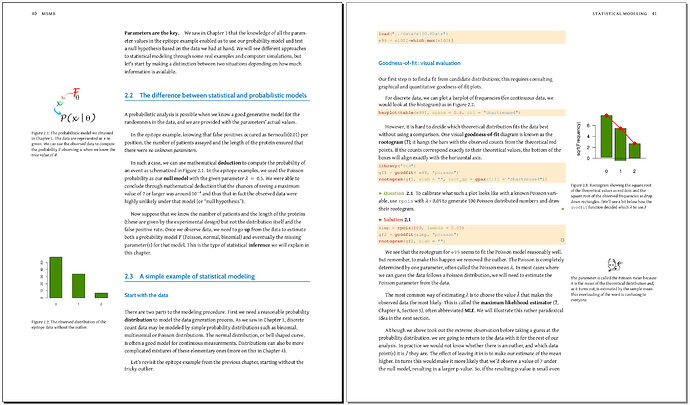 Surprisingly hard work getting from the original LaTeX/Sweave to R Markdown, but from there bookdown and tufte got me a good chunk of the way to a HTML version the authors liked. The current version of the book definitely still has some 'hacks' to place things where I want them to be, and I'm still learning a lot about the internals of knitr, so I'm continually refining msmbstyle to try and simplify things. It'll be cool if others want to use it too. This is absolutely fantastic! I am very happy, that I just found this and thank you very much for sharing. 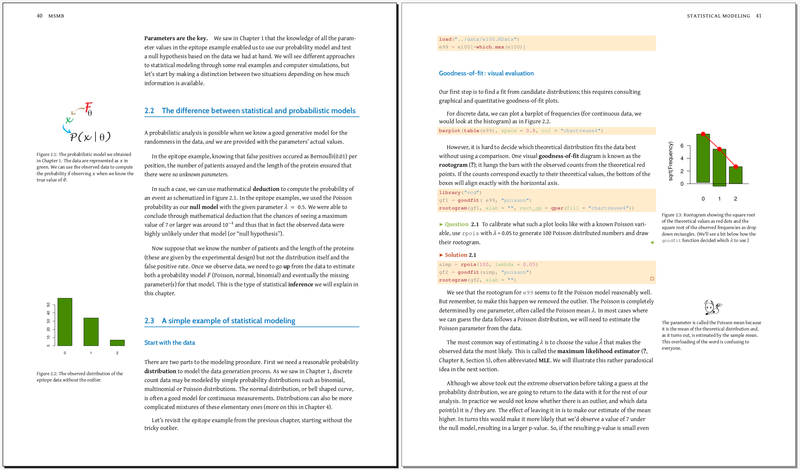 Is there any chance that the LaTeX/Sweave style might be published as well as the strength of r-markdown is cross-media-publishing? Apropos cross-media-publishing: When I tried to compile the example files from the package to PDF via render_book('index.Rmd','tufte::tufte_book') I got an error message because of the question-chunks. Of course I realize that the package was designed for HTML output and nothing else at the moment, but is there a workaround for rendering these chunks to PDF?